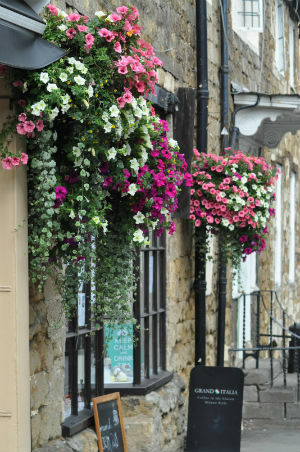 For the sixth year running Wotton in Bloom will be decorating the main streets of Wotton-under-Edge with hanging baskets and troughs full of flowers. We think, and we hope that you agree, that the floral displays really enhance our lovely town and make the streets vibrant with colour. Each basket or trough is partly paid for by the trader or residents on whose building it is displayed. As this is very much a public and community enterprise we fundraise for the remaining cost. There is always an exception to any rule – in this case our charity shops whose baskets are generously sponsored by local clubs and societies. We try to contact all our clubs and societies, local businesses, traders without a presence on the main streets, churches and many others asking for donations towards the project. We also receive donations from individual local residents and visitors to the town. We are immensely grateful for the support that you have given in previous years and are heartened by the lovely comments and thanks that we receive. This is not a cheap project due to the narrow streets and the architecture of our historic town. We wouldn’t have it any other way but it does make watering difficult! We cannot do it ourselves ( I don’t do ladders) but have a local business who water and feed the flowers regularly throughout the summer. This year we would like to put the flowers up by the end of May to support the Wotton Secret Gardens on 29th, but we are all gardeners so it is weather dependent. They stay up for as long as possible; last year they were taken down in October and still looked pretty good! So – if you, or a group or club that you belong to would like to make a donation you can either leave an envelope at The Market Place at 46 Long Street, or contact me on 01453 521263. We are also looking for a few volunteers to help put the baskets up again, please contact me if you would like to help, it’s more fun than you think! Please look out for our photo display which will be at various events in the Town this year. 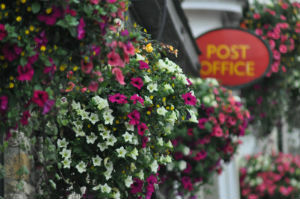 We also have Wotton in Bloom collection boxes in several shops.